Great Zamani Feelings shot of Bruce Arians, Geoff Collins and Todd Bowles on Saturday. Having seen names like Myron Myles and Lou Angelo light it up on Cherry and White Day and disappear a few months later, I’ve come to take a skeptical view of one-day spring wonders. That said, spring practice is more than a month of hard-hitting and difficult throws and catches so the cream seems to rise to the top over 30 days and this year offers several intriguing candidates. Forget some of what you will see on Saturday in the spring game and remember a lot of what you see below. After Ventell Bryant and Isaiah Wright—probably one of the best receiving tandems in the nation—there was a huge dropoff in talent from the first to second unit. Ryan, one of NYC’s top receivers a year ago, seems to be filling the talent void and has made a number of difficult catches with the kind of deep speed that Wright seems to have. Offensive coordinator Dave Patenaude likes to use three-receiver packages and do not be surprised if Ryan is able to make an impact right away. Patenaude said at the end of last year that Russo was “light year’s different” in practice in December than he was in September. Add that to the fact that Patenaude also said early last March that Russo corrected a “looping motion” in his release plus increased playing time with the ones means that Russo could slot into the role Nutile had at the beginning of last year—a guy in the No. 2 slot who is ready to get his chance in a real game. Mix in the fact that the staff is trying to find new positions for Todd Centeio and there is a clear indication that the first and second jobs are Frank Nutile’s and Russo’s. A lot of the Philadelphia area has been waiting to see what Russo can do in a real game and not a practice or a scrimmage and this year could very well be that chance. It took the staff eight games before it finally decided to insert Nutile in there to give him a chance to run the squad and hopefully they will give Russo the same chance this season that Juice got last one. One thing that has been a relatively accurate predictor of future success at Temple for any player has been eye-popping numbers in high school. Folks here kind of knew Adam DiMichele would have projected as a pretty good quarterback here when he tossed 35 touchdown passes as a senior for Sto-Rox in the WPIAL. As a running back, Gardner had far better numbers than the other guy, Ryquell Armstead, who came in his class. Gardner’s senior year numbers: 2,776 yards and 36 touchdowns on 282 carries. Armstead’s senior year numbers at Vineland (N.J.): 1,488 and 18 touchdowns. Gardner got injured and fell behind and now seems to have caught up. Head Coach Collins said this has been a “break out” spring for him. Since Gardner already owns the Temple all-time record for longest run from scrimmage, that bodes well for this year. Already one of the greatest “names” in Temple roster history, Rock looks primed to become one of the great producers on the field in this his first season for the Owls after transferring from FCS school Presbyterian. Last season, playing for a Villanova-level school, Ya-Sin led his team with 49 tackles and five interceptions. More importantly, he has stood out during spring practices in an area of need—defensive back—as the Owls scrape hard to find replacements for three departed starters. Benny Walls, Safety, Cherry Hill, N.J. and Keyvone Bruton, Norfolk, Va. Walls was a standout for a great state championship team in St. Joseph’s Prep and clearly the star of Wednesday’s practice when Collins tweeted that Walls had a dominant day. Walls was a two-time first-team All-Catholic playing in one of the best high school football leagues in the nation. Benny has great athletic genes. His dad, also Benny, played basketball at Camden High and his uncle, Kevin Walls, was even more famous–scoring 81 points in a single game for Camden High before going off to Louisville to play his college basketball. Bruton—not to be confused with defensive backs coach Nate BURTON (different spelling) had 18 interceptions for Lake Taylor (Va.) High and is just as likely to be a starter with Delvon Randall as Walls is and this should be a position battle that lasts through the summer. A lot those topics are all about injecting fun into college football for the other 104 scholarship athletes on the roster. If you do those things and lose, it’s called shtick. If you do those things and win championships, it’s called innovation. As a cub reporter for the Temple News, I had a sit down with then Temple football coach Wayne Hardin in his cramped McGonigle Hall office and asked him what was the most “fun” thing about being Temple football coach. “To me, the only thing that’s fun is winning,” he said. On his last day as a head coach, he mentioned to me he was quitting at the end of a mediocre 1982 season. Standing in a small room after the last game, I asked why. “Mediocrity is not my cup of tea,” he said. That was at what I thought was a pretty young and vital age of 55. Nobody won more and lost less as a Temple football coach, so I consider Hardin, not Geoff Collins, the expert here. I wish coach was alive today so I could ask him about the bullet points above, but he’s not and I don’t think he would look too kindly on the changes. It wouldn’t have as much to do with being an old foogie as it would be a difference of philosophy on how to get to the end result. To me, a 7-6 record is the very definition of mediocre, bowl win notwithstanding. 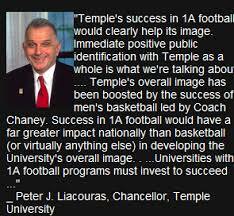 Temple is going to have to do better this year for it to be a successful season. To me, Temple TUFF is back-to-back 10-win seasons, not finishing around the middle of a 126-team FBS pack. Position flexibility is a great thing if you have a pass rusher like Romond Deloatch who also plays wide receiver. I did not see any of the pass-rushing attributes in Keith Kirkwood that I saw in Deloatch, so taking reps from Deloatch on the other side of the ball for the minimum snaps he gave the team as a DE last year was, in my mind, counterproductive. Now we have the team’s best linebacker, Shaun Bradley, taking reps at a position where the Owls are deep—running back—and you have to question the process. The Owls did not use Nick Sharga as a fullback last year nearly as much as they did in that championship season two years ago and, in retrospect, they probably should have used him at a position of need, linebacker, if the offensive staff felt he wasn’t going to get reps. Sharga was an impact player on defense at Army, and a forgotten man the rest of the season. Whatever Collins decides to do is OK with me, as long as the bottom line is achieved—a championship. If it doesn’t happen this season, his daddy (Pat Kraft) should take the T-Bird away and replace it with a whip. As coach Hardin says, the only fun in football is winning and that should be the eternal measuring stick. Until proven otherwise, anything else is shtick. Like last year’s Temple football team for instance, the last month of weather has been a tease. Those back-to-back 77-degree days of late February have been replaced by some brutal cold since. Since last year ended OK (not great), we’ll say by Cherry and White Day it will be nice and warm. The calendar says the Owls start spring practice tomorrow, but it won’t look that way. Spring practice is in the air. Spring, on the other hand, seems a long way away. At least the new indoor facility is the equal to anything a P5 team has. Either way, the Temple Owls’ football team will have to deal with the 1-3 inches on the ground or move the first practices of the “spring” a couple of blocks away to the spectacular new $50 million Aramark Star Facility at 15th and Montgomery. That’s a call for head coach Geoff Collins to make, though. Bruce Arians used to come to Geasey Field on spring practice days—there was no indoor facility back then—and open with “get your work done” in that Southern accent he developed while a player at Virginia Tech, even though he was from York, Pa.
What will Trad Beatty’s role be? The super quarterback recruit from South Carolina obviously is a Dave Patenaude favorite but, in the entire history of Group of Five football, no true freshman starter has led his team to a G5 league championship. That factor has to be weighed in the development of Beatty and the goal of the Owls to win the 2018 AAC title, just like they did the 2016 one. In Frank Nutile, they have a bowl-winning quarterback and a guy who has the best passing stats in the nation against a rush. Juice will be awfully tough to beat out. Who are the defensive backfield replacements? The Owls lose three of their four starters at the key positions of cornerback and safety. The only returner is first-team AAC safety Delvon Randall. They will have to plug around the edges. The speedy Linwood Crump Jr. has the inside track on the left corner spot, while the right corner spot will probably be occupied by Rock Ya-Sin, a first-team All Big South performer who had more interceptions against Wake Forest (one) in 2016 than the whole Temple AAC championship team did. Other than Ya-Sin, who starts immediately? My money is on Nickolas Madourie, an incoming junior college transfer from Dakota College at Bottineau in North Dakota. Shortly after former Central Florida coach Scott Frost took the same position at the University of Nebraska earlier this month, Madourie rescinded his verbal commitment from the Knights. Madourie had 45 tackles during his recently completed sophomore season, including 17.5 sacks. If the Owls go three wides on offense, look for true freshman Sean Ryan from NYC to join Isaiah Wright and Ventell Bryant. Me, I hope they scrap the three wides, use a tight end (Kenny Yeboah) and a fullback (Rob “Nitro” Ritrovato). We should find out the answers to those questions by April 14. Hopefully, by then, spring will have already arrived. Every once in a while, a spring camp phenom bursts onto the scene and that is usually a term for baseball players who tear it up in the spring to make the club unexpectedly. Spring’s second favorite sport—college football practice—also has a version of that. Last year’s breakout star for Temple was a wide receiver named Marshall Ellick. Then head coach Matt Rhule said he had “five NFL scouts come to my practice on different days” and ask who Ellick was. Ellick caught a touchdown pass that could have impacted the Penn State game but it was called back due to a phantom block in the back called by (ironically enough) AAC refs on Dion Dawkins. Replays clearly showed Dawkins blocked his man on that touchdown legally on the side, not the back, but a hold like that is not reviewable. This is the “best” deal we’ve seen on Ebay for tickets. Drew Katz can afford it. Ellick got injured after that and we have not heard much about him this spring, although it is very possible he will be a major contributor in the fall. Chances are after Saturday’s Cherry and White game, we will have our own opinions but, for now, I like the comparisons fellow Owls are making of receiver Adonis Jennings. One of his fellow Owls compared Jennings to “Megatron” and the former Detroit Lions’ player was a special kind of athlete. Temple fans got a glimpse of what Jennings could do near the end of last season and in the Military Bowl. Let’s just put it this way. If all of the Owls had the production of Jennings in the Military Bowl at their positions like he did at his, the Owls would have won the game, 56-18. Other than the personnel implications, on a personal note getting to meet and talk to Geoff Collins is important. I waited in the Military Bowl tent for him for two hours but he did not show up until much later. Since I thought he was not coming, I made the sprint to tailgate with “regular” Temple fans on the other side of the stadium. While a good time was had by all, I only heard during the game that Collins made a late but impressive appearance for the fans who remained. I hope he does the walk-through at Lot 10 that Matt Rhule made his first year as head coach. Rhule walked up to every fan and personally shook his or her hand and made a point to listen to what they had to say. Rhule listened to me, put my ideas (fullback, play-action passing, a blocking back to protect the quarterback against blitzes) in the circular file and went rubbishing through that file to implement them by his third year. Hey, better late than never. As a spread offensive team, the Owls won two and six games. As a play-action offensive team with a fullback, they won double-digits in back-to-back years. Collins is a little ahead of the curve since he called Nick Sharga “the best fullback in the country” on the Zach Gelb Show yesterday. Collins, while praising his QBs, said no. That’s a good thing, not a bad one. Let it all shake out over the next few months. Hopefully, if the Owls can’t get a spring Phenom at that position, they will settle for a summer one. This post is best-prefaced by saying the real football-related questions Temple fans have are always answered by the second game of the season. There are few questions even answered by the first game as a team makes its leap to good or bad by how it improves between game one and two. If you judged Temple by its first game last year, you might have thought the Owls were headed closer to the AAC basement than its penthouse. By game two, the Owls straightened out a lot of their problems. What Are The Owls Doing About the Linebackers? A year ago, the pundits who were looking from afar said the Owls would be screwed by the loss of National Defensive Player of the Year Tyler Matakevich. The people closer to the team said not so fast. Now it appears the Owls have taken a bigger hit by losing their three starting linebackers. Still, Jared Folks saw plenty of playing time at that position and Shawn Bradley was recently awarded a single digit (8), so maybe the Owls are better off than some think. If they go to a 5-2 defense, they might. Did the OL Get Any Better? The offensive line did pretty much a stellar job throughout the AAC championship run but got handled in the Military Bowl game against Wake Forest. A lot of that was the incredibly poor coaching that the Owls displayed that night—running to the right when their NFL draft pick was on the left side—but still that NFL pick will be gone in the fall. The Owls have to show toughness by Notre Dame. Who Will Replace Jahad Thomas? Since Ryquell Armstead and Jahad Thomas each had 918 yards rushing from scrimmage a year ago and Armstead is back, the Owls will not have to replace Armstead. They will, however, have to replace Thomas and Jager Gardner—who still holds the Temple record for longest run from scrimmage—appears to be that guy. If both Armstead and Gardner get 918 yards from scrimmage, chances are Geoff Collins will sign for that now. What Does Mayhem Look Like? This is probably the question that will be closest to answered by Saturday. There will be plenty of “Mayhem Is Coming” T-Shirts being sold on Saturday, so bring money. If the Owls’ defense brings more pass rushers than opposition can block, then you will have a sense of Mayhem. What Collins has done in the past is to hit the quarterback early and often and create fumbles and interceptions. If there’s a sense of that happening on Saturday, you have your answer. New offensive coordinator Dave Patenaude said Owl fans should not worry about the quarterback position because he has a variety of good choices. Owl fans are worrying because the only quarterbacks Patenaude has seen before coming here played at places like Georgetown and Coastal Carolina. The battle appears to be down to Logan Marchi and Anthony Russo now, and Owl fans will get a feel for both players on Saturday. This Joseph V. Labolito shot is the photo of spring practice so far. The tradition at Temple has been to name nine special tough guys before the first game of the season and number those guys 1-9, not necessarily in order of toughness. Temple University official photographer Joseph V. Labolito captured the essence of the single digit tradition and the university in general with one general iconic photo shot (above) last Thursday. In the background, is a smiling Bernard Pierce—one of the few guys who turned down the honor of the single digit—and in the foreground is the toughest of the tough guys, Nick Sharga. There are a few digits left, but here’s a novel idea. Be very stingy about giving out the numbers just to fill out the roster. If the Owls find enough guys who meet the standards of guys like Sharga, Ventell Bryant, Sean Chandler, Keith Kirkwood and Jacob Martin, then they should hand out the rest of the numbers before the Notre Dame game. If not, make it a game-to-game thing for performances in the game before or just hold the number open. That makes the honor that much more special. Who fills out the list? My guess if Sharif Finch will be at least a candidate for a single digit. How long as Finch been around? He played a terrific game as a starting linebacker in a loss at Rutgers that would have been a win had he not been called for a bogus penalty on a late hit two plays before RU hit the game-winning touchdown pass. That was way back in 2013. Finch is also a big-time playmaker and has blocked five punts in his Temple career and also picked off New York Jets’ quarterback Christian Hackenberg in the key play of a 27-10 win over Penn State two weeks ago. Other than Finch, a darkhorse candidate could emerge. Maybe Ryquell Armstead, but, either way, Temple will need more than nine tough guys to be successful whether they get a single digit or not. Love this photo because it shows the level of fan support in background. When practices are closed to the media, as they are for all but the last 10 minutes this spring, reading from the snippets is probably the best way to glean information. What we did learn from the first practice was at least two fascinating things: One, the first play from scrimmage was a handoff to Nick Sharga, and, two, that the guy new head coach Geoff Collins was playing catch with at the end of practice was Anthony Russo. It probably takes a huge leap of faith forward to interpret those two facts into an increased role for Sharga in the offense to a favorite at the quarterback position, but that’s all we have right now. It makes sense, though, for at least two reasons. One, Collins got close to Sharga in the legal activities part of the offseason as his position coach. Collins named himself the fullbacks coach, much like Al Golden named himself the special teams coach in his first year. Collins probably knows what he has in Sharga is exactly what former coach Matt Rhule said he had: An NFL fullback. An increased role for Sharga only makes more sense in that light. In addition to being a terrific blocker, Sharga also carried the ball effectively a year ago, gaining 97 yards on 18 carries, a 6.9 average. Giving the ball to Sharga a few times a game, even two or three, keeps the defense from keying in on guys like Ryquell Armstead and Jager Gardner. The Russo thing is particularly interesting because Collins could have had a catch with any of his five starting quarterback candidates but chose that one. Maybe, but until the Cherry and White game, that looks like all that we will have. Wednesday: Rookie of The Year?